How fast can you found an antenna? 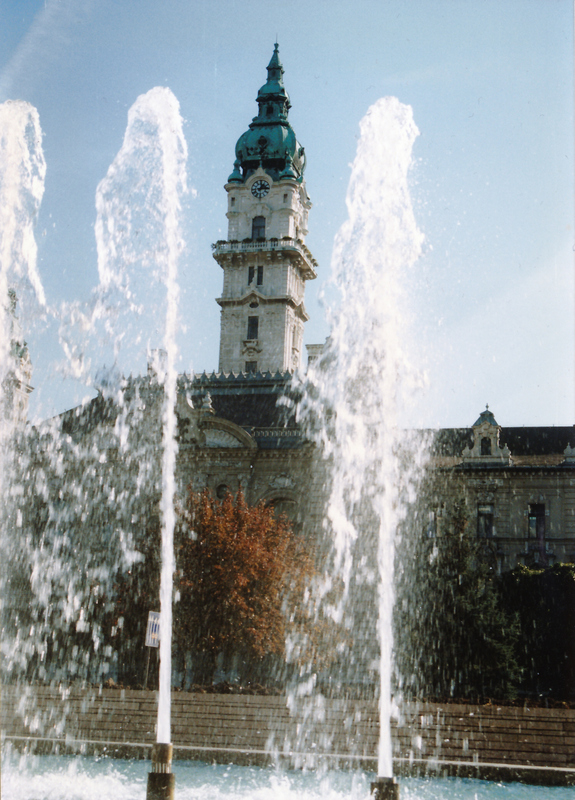 On the last weekend of August 1997 I left Germany and my antenna AEGEE-Göttingen in order to spend a year in cosy Hungarian baroque town Győr. A city in the middle between Vienna and Budapest, with a small university, but no AEGEE. Of course, it couldn’t stay like this and so my plan was clear: founding an antenna as soon as possible. Györ – too beautiful for not having AEGEE. Just by coincidence, the autumn Presidents Meeting (PM) took place from 19th till 21st of September in Veszprém, another cute Hungarian town with a long history. Veszprém was only 70 kilometers away, near Lake Balaton – and had a well-established AEGEE antenna. The PM was a predecessor to today’s EPM, and there were two per year, in spring and autumn. It was a standard procedure that Contacts could sign the Convention d’Adhesion there and – different from today – no Agora ratification was necessary. The PM could ratify it. Now this created a great opportunity and a real challenge: why not founding an antenna in just three weeks? After arriving to Győr, I wrote to the AEGEE-Europe headoffice and became Contact Győr. Today you need to provide a letter of support from an institution of higher education in that city. But not in 1997. How to get members in a week? 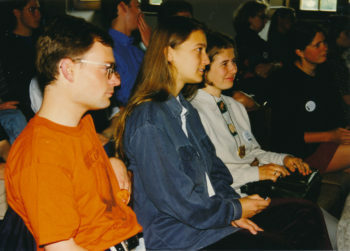 AEGEE-Györ at the Cinema Conference in Passau, April 1998. The next thing I needed was ten members. Well, I didn’t really know students there yet, the term hadn’t even started, but who says that the members need to be local students? Well, today you need to have a members list with at least ten members of which at least five are not a member of another local. Not in 1997. So I started to write e-mails to my AEGEE friends all over Europe, presented them the idea of signing the Convention d’Adhesion at PM Veszprém and asked them to join my future AEGEE-Győr. The only thing they had to do was putting 10 Deutschmark or 10 Dutch Guilders into an envelope and to send it to Győr. This was way before SEPA, bank transaction fees were too high. And getting money by envelope had a certain charm. Within a few days the envelopes started to arrive and the money piled up. Soon I had more than 20 members and some more people wrote back that they would like to join and bring the money to the PM directly. Everything was on track and I sent a nice members list to the CD. 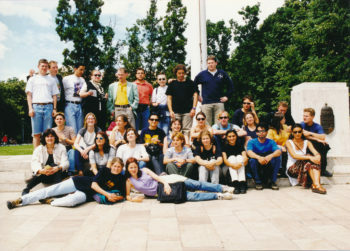 The AEGEE-Györ delegation at Agora Maastricht 1998, the biggest Agora ever. But one more thing was missing: the statutes. Today a Contact must send the CD a copy of them in both original language and English. And they need to be checked by the Juridical Commission. Since I was Subcommissioner for the very first NetCom, I had statutes of several Hungarian antennae on my computer. 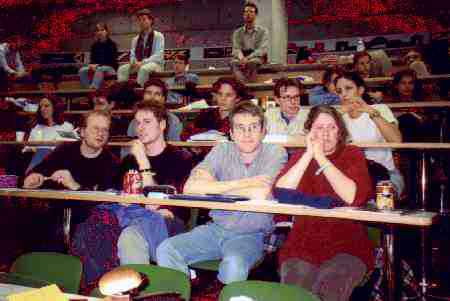 However, they were all in Hungarian, since back then it was not a requirement to have English statutes as well. So I pasted the name AEGEE-Györ in the statutes of AEGEE-Debrecen. The fact that the Juridical Commission did not speak Hungarian was not a big obstacle. Both – the Juridical Commission had one member less than today – were from AEGEE-Passau, good friends of mine and also members of my new Contact. So we agreed that we would make a founding meeting with all our members in Veszprém, where I would provide them a well-respected Hungarian translator, who would explain them the statutes. 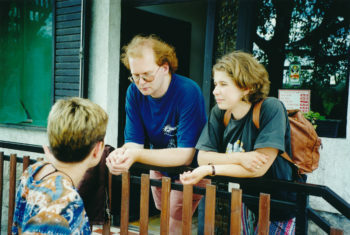 This translator was no one less than former CD member Szilvia Szabó from AEGEE-Debrecen. The weekend of the PM arrived and it all went perfectly. The number of Contact Györ members had gone up to 35, including PM participants who wanted to be part of this. They all paid an amount which is between 4,50 and 4,90 Euro, giving the new local a good start. I invited everyone to a founding meeting at a pizzeria opposite the university. We got ourselves a big table in the sunshine, where we explained the Juridical Commission the statutes over lunch. While enjoying nice pizza and beer, they did not find any obstacles and gave green light for the signing of the Convention d’Adhesion. AEGEE-Györ Treasurer Judit Varga and me at our SU. It took just 20 days to found this local. If you now thing that this was not very serious, it’s not the case. In the next months I found nearly 20 local members for AEGEE-Győr, a lot of them applied for Summer Universities, travelled to conferences and we also organized a great Summer University with AEGEE-Wien the next summer. One day after the SU finished, I packed my stuff and went back to Germany. This time the destination was Lübeck, a beautiful medieval city near Hamburg. And without AEGEE. But this time I took it slow, we signed the Convention d’Adhesion after one year and with only local members. The Cozy Side of AEGEE: Join the NWM in a Mountain Cottage!